U Has Sheep for Wheat? Star Trek‘s “The Trouble with Tribbles” is being retold. A joke about Settlers of Catan is being made. This is a parody of lolcats. This image is actually just one from a larger LOLTrek series that retells the entire “The Trouble with Tribbles” episode in lolcat dialect. It’s funny stuff. I get the Cataan reference now that you point it out. 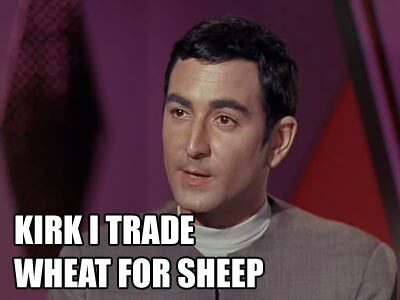 When I first read this loltrek it only puzzled me. Oh man! I’ve read this several times, but never caught the “Settlers of Cataan” reference. Which I’ve only started playing in the last few months (great game!) Lately the whole “lol cats” meme has been my guilty pleasure. The whole thing is just hilariously goofy! I recommend going to ytmnd.com and searching for “cats” or “harbl”. There is a pretty funny little slideshow w/music somebody made that strings a whole bunch of the “lol cats” stuff. together. Darmok and Jillard; at Tenagra. Darmok and Jillard; on the ocean. Oops. I accidentally posted another entry for a few minutes. Sorry about that. I wrote this one a week ago and scheduled it for today and forgot about it. Then I just wrote a jumbo story entry that posted. You’ll have to come back tomorrow for that. I did see that and get it, even the lolcats. 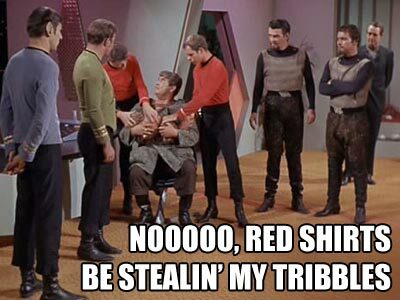 Redshirts be stealin’ my tribbles, indeed. I dont get any of it. Every single movie and person mentioned is as if you’re speaking Greek! What planet do you inhabit? They aren’t speaking Greek, they are speaking Klingon. Its not Greek, we’re speaking geek! Whoever you are, Live long and prosper, I think I love you. I love stuff like this. I often refer to play money as “Quatloos” and wait to see if anyone gets the reference.